Sculptor John Dann (left, in sweater) helps place the statue of Sir John A. Macdonald outside Victoria City Hall. The Father of Confederation represented the city in Parliament, though he did not get around to visiting until eight years after his election. John MacKay photograph. Happy birthday, Sir John A., born 196 years ago Tuesday, which means we’ve been misspelling your Scottish surname for nigh on two centuries. Ah, Mr. Macdonald, but how shall we celebrate? Cake? We mark the august occasion mostly by indifference. You are remembered in a modest fashion — a bridge here, a highway there. An airport in Ottawa. Lots of high schools. An engraved portrait on our $10 banknote, a bill as purple as a campaign speech. You have been cast in bronze, usually wearing a Prince Albert coat, holding papers in one hand, mouth open in silent oratory — on Parliament Hill in Ottawa; outside the Ontario legislature in Toronto; sitting on a bench in Charlottetown, PEI; in your hometown of Kingston, Ont. ; in Regina (across from a memorial to Louis Riel, the rebel you hanged); and, atop a plinth in Place du Canada (formerly Dominion Square) in Montreal, where you have been the target of bombers and nationalists over the years. You suffered the indignity of decapitation by hacksaw some years ago, but the head has been restored and the entire monument is undergoing a sprucing up to be unveiled later this year. You stand at the entrance of the annex to Victoria City Hall, arms behind your back, your weight against the left leg, a rearward lean to your stance. It is hard to say whether you are coming, or going. The statue was commissioned by the local Macdonald Society, who wisely chose the artist John Dann. The society graciously offered his work to the people of a city you once represented in Parliament. The life-sized depiction shows the first prime minister in contemplation. Mouth closed. Belly extended. Gaze fixed in the distance. Whatever can you be looking at? The statue was installed 19 years ago this week, a birthday gift from private citizens. Originally, you were placed looking towards city hall. You have since been spun ’round, where at least you can catch the action on the street. Hardly anyone pays any attention. Even those who donated it soon after asked for permission to move you to a locale more fitting your stature. It was suggested the man responsible for Confederation, the building of an intercontinental railway, and the National Policy of tariff protection might be better suited amidst the flower beds of the manicured grounds of the Empress Hotel. (Left unsaid was your role in the Pacific Scandal, or the imposition of the Chinese head tax.) In any case, city councillors voted 8 to 1 to keep you as a sentry at the Pandora Avenue entrance. Lest you take solace in the single vote, it should be noted that councillor thought you a drunk bought and paid for by railway interests. The reception was warmer in 1878. In those early days for the nation, voting in a federal election did not take place simultaneously across the land. Mr. Macdonald lost his Kingston seat by 144 votes to a Liberal wholesale grocer. He sent a telegram to supporters in Victoria asking for a nomination in the two-member constituency. The member of Parliament did not get around to visiting the constituency until eight years had passed. On Aug. 13, 1886, Sir John wielded a silver sledgehammer to knock home a golden Last Spike at Cliffside, near Shawnigan Lake, at Mile 25 of the new Esquimalt and Nanaimo Railway. The prime minister praised the railway as “a means of settling the beautiful island, and adding to the prosperity of the country at large.” He proposed three cheers for the railway and for its builder, the coal baron Robert Dunsmuir. 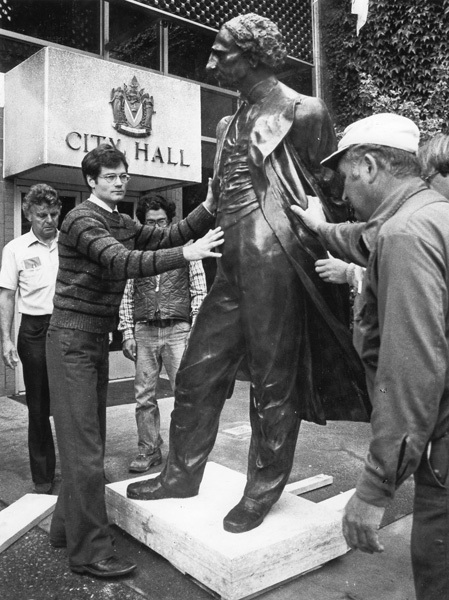 Back at city hall, the statue is not without critics. One suggested it made the Old Chieftain look like he was riding a skateboard. Instead, let’s consider his propensity to enjoy libations. So august a periodical as the Journal of Canadian Studies just four years ago published a footnoted article titled, “John A. Macdonald and the Bottle.” To me, the statue has the look of a drinker gathering himself to once again enter the fray. Let other lands celebrate mighty warriors. We have clever dipsomaniacs. Sir John A. Macdonald (No. 13) arrives at Port Moody, then the western terminus of the Canadian Pacific Railway. The prime minister's visit in 1886 included a trek to Vancouver Island, where he used a silver sledgehammer to drive home a golden Last Spike in the Esquimalt and Nanaimo Railway. City of Vancouver Archives photograph. I think that he did a great job with all those things that he made. they should add some of his knowledge on Generic Viagra ad campaign.